Jelly Roll Morton may have reached the pinnacle of New Orleans jazz with his Red Hot Peppers band, but there was a wealth of other exceptional jazz released in 1927. Morton dazzled just as much in a smaller group, Fletcher Henderson kept pushing the boundaries of big band jazz, and Louis Armstrong abandoned the blueprint mid-song and transcended jazz all together. After his Red Hot Peppers sessions in 1927, Morton took a break to record one of his most famous compositions accompanied only by the Dodds brothers: Johnny on clarinet and Baby on drums. This tune was originally written as ragtime, and indeed for the first half of the record, Morton plays it as a straightforward, solo rag. 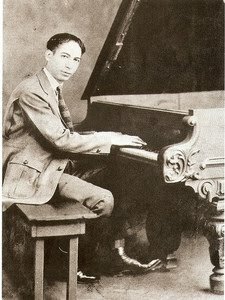 Morton was one of the best ragtime pianists in New Orleans, and his playing here is marvelous, but there is very little in it that hints of jazz. Then, about half way in, Johnny and Baby enter and it starts to swing. Johnny carries the frontline by himself for a while, not straying too far from main melody, as his brother and Morton play softly in the background. Then the other two start to play more forcefully, Johnny’s playing gets more inventive, and the whole thing really starts to cook. By the end, it has transformed into full-scale hot New Orleans jazz without a hint of ragtime. This classic is the most kinetic thing Henderson’s band ever recorded. Coleman Hawkins (tenor sax) and Buster Bailey (clarinet) are absolutely brilliant as they trade solos in the first half, and trumpeter Tommy Ladnier and trombonist Jimmy Harrison do an admirable job when the brass instruments take over in the second half. Throughout, the playing skitters to and fro with the kind of nervous energy implied by the title. In May 1927, Louis Armstrong temporarily expanded his Hot Five band to a Hot Seven with the addition of tuba (Pete Briggs) and drums (Baby Dodds). Although the work continued to be of exceptional quality in general, one song from these sessions stands out as an all-time classic: “Potato Head Blues.” (Don’t let the title fool you: this is not a silly or humorous song; it is actually quite beautiful.) For about the first two minutes, it fits right in with what we have come to expect from Armstrong and his crew: an incredible, memorable melody and superlative musicianship. Armstrong and Johnny Dodds play together, then take turns soloing, and it is all stunning to be sure, but we have come to expect stunning. Then, after a brief banjo interlude, we reach the final minute, and discover that Armstrong has been holding back. He now launches into a solo that will stop you in your tracks. It is haunting, absolutely hauntingly beautiful. The band plays extreme stop-time behind him, and it is amazing that such discipline and sense of swing can exist in the same space. Armstrong’s trademark timbre is laid bare in the gaps left by the band, and… words fail to describe it adequately. Suffice it to say, this is Armstrong’s most perfect moment. The rest of the band eventually starts playing fully again, but Armstrong doesn’t make any adjustments: he just keeps playing this magnificent solo and overpowers everything else. It is a magnificent ending. Go listen to it!